This book immediately caught my eye. This was due to the review on the front cover, which bodily exclaimed that Stewart was ‘possibly the one travel writer who is genuinely funnier than Bill Bryson’. Bill Bryson is my favourite author on the planet, so this was a lofty claim. Despite not knowing whether I a) think that this could be right and, b) even *want* it to be, is Neither Here Nor There (pun intended. I love you, Bryson…). It’s a travel book and it’s funny. That, people, was all it took for me clutch it in my sweaty little paw and scurry towards the till. Plus, it’s set in Spain, which is a country I adore. How bad could it possibly be? This book is part of a trilogy of which I don’t actually own the first instalment. I feel, however, I am intelligent enough (debatable) to make it through without. I can always catch up on the first book if I like this one enough, can’t I? The author, who was the original drummer in Genesis, no less, tells tales of living on a rural farm, south of Granada. He also reminisces about his previous life as a sheep shearer in Sweden. Yep. You’ve guessed it. This is the final book of the trilogy of which I don’t own the first instalment. To be honest I hadn’t actually realised when I was browsing. I’m not sure what bothers me more; the fact that I’m not bright enough to have realised, or the fact that someone in Dolgellau handed in parts two and three of a trilogy, but couldn’t bear to part with the first one? What kind of monster does that?? Regardless of my suspicions about the proclivities of my fellow North Walians, once I read the blurb on the Pepper Tree book about Bill Bryon, I was never going to be able to leave this one behind either, was I? I spotted this book, with it’s gorgeous Agatha Christie-esque cover and knew instantly that it had to be mine (cue evil laugh). It also happens to be based between Florence and Sardinia, so it was never going to escape my grasp once I got my meaty pie hands on it. I am completely here for *any* kind of death in Italy, even on my normally morbid-free holidays. Perhaps if I was visiting Sardinia I might be a little less keen, but I’m not, so I am. After getting the book home and actually taking time to read the back cover, I realised that this is also part of a trilogy. WTF is it with authors and their determination to write novels in sets of three?? Also, why do I never notice these things *before* I pay for them??? To be honest, I’d likely have bought it anyway, even if just for the cover. Although I’ve heard you should never use this to judge a book, so I will read it regardless. Still, if you’re reading this, Marco, enough with the multiple titles about the same character. Grazie. This story of strong women facing tough challenges in a male-dominated society in Afghanistan is based in the capital city of Kabul. It surrounds the lives of five very different ladies who frequent the same coffee house. Sunny, Isabele, Candace, Halajan and Yasmina bond over shared passions and problems, despite coming from very different backgrounds. This is definitely not a book I’d normally have picked up had it been based in, say London or Paris. However, the backdrop is as central to the story as the women themselves. Although it’s not glamorous, it certainly is very real. I have to admit that I don’t often (read: never) pick up books that are set in France from no other reason that it’s not really somewhere I’m that invested in being. I have been – on numerous occasions – but it simply doesn’t hold the same fascination for me as other locations. That said, the description on the back made me think I *might* get over my general ‘meh’ attitude towards France. If I can, I’m going to do it, what better way than with a best seller? Mayle, as it turns out, is a fellow Briton and this work, for which he’s most famous, was written 27 years ago. And I quite like the thought of reading about somewhere that’s undoubtedly changed immeasurably since the novel was first penned. Once my holidays are over, I will return, as I do every autumn, to my favourite book: ‘ A Walk in the Woods’ by Bill Bryson. That is if I still think he’s as funny by the time I’m finished this lot. 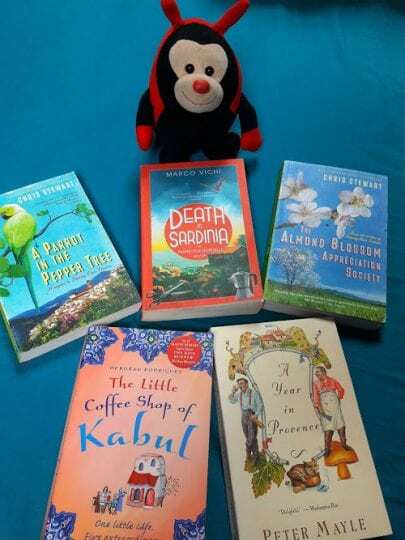 What travel books are on your holiday reading list?